Early in my practice, I witnessed reiki’s ability to gently support the release of physical and emotional trauma from a concussion. I was a reiki 1 practioner when I found myself at a conference sitting next to Lynn Reed from Sarnia. She looked dazed, and explained that she’d been in a car accident the previous week. Another driver had gone through a stop sign, slamming into her car, knocking it into a cement pole and throwing her head against a window. 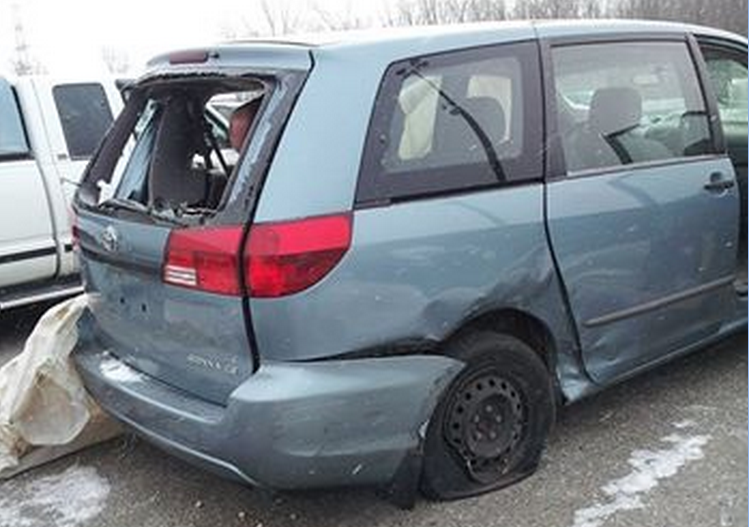 The pole was wiped out, the minivan badly damaged, and Lynn received a concussion. So what was she doing at a weekend-long conference 4 hours from home?!? She explained that she had registered months earlier and had really been looking forward to it. After the accident, as the owner, leader and trainer of a busy Pampered Chef business and mother of two young children, she knew she’d get more rest staying at a hotel than she would at home! Indeed, she had slept for most of the day and left her room only for dinner and to see the keynote speakers. I wondered if reiki could help and offered her a session. Lynn looked relieved and immediately accepted; she seemed open to trying anything! So after dinner we began. The sensation I felt at Lynn’s head was “buzzy;” a description she agreed with. Soon she reported a tingling, electrical type of sensation running down her body. A short time later, her whole body started to shake! We were both very surprised. Searching for an explanation, I recalled that in my reiki 1 course, I had given reiki to a woman who had received kidney transplants three times. During the session, she had also shaken, and my teacher explained it was one possible way of releasing physical trauma. Remembering this, I trusted that all was well and continued. Lynn kept shaking as I worked my way down her body. By the time I reached Lynn’s lower body, I was picking up emotions. I appreciated and felt overwhelmed by the weight of Lynn’s struggle to hold herself together after the accident. In spite of her physical injury and accompanying emotional shock, she had continued to care for her family, manage her business, and deal with the added pressures of liaising with a garage and her insurance company! What an incredible woman! Profoundly moved, I told Lynn I recognized her bravery and all that she had done. I was compelled to let her know that she was appreciated, and loved. By the end of the session, Lynn had stopped shaking and fallen asleep. After I attuned to reiki 2, I was able to send Lynn distance reiki to support her healing. Lynn notes that, “studies are being done on concussions and how long they last. And getting all the help you can.” Since her accident, she has been doing just that: making regular visits to a homeopath, massage therapist, chiropractor and physiotherapist, and getting lots of rest.